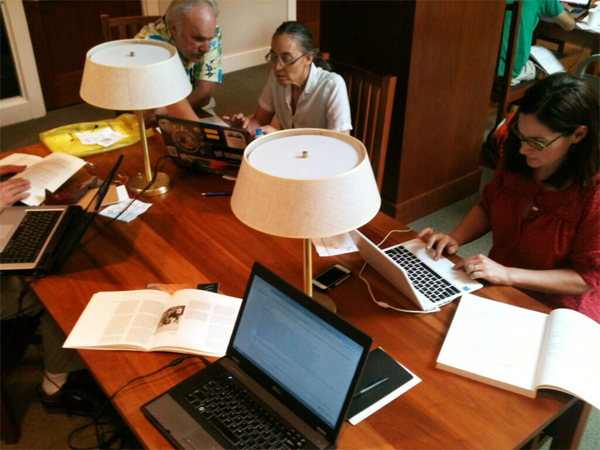 On Sunday, about fifteen volunteers came to the Phillips Library to help create and expand Wikipedia articles related to American artists both in our Made in the U.S.A. exhibition and the rest of our permanent collection. It was a great day of work; many articles were improved and others created from scratch. The spirit behind Wikipedia aligns with our museum’s mission statement—a dynamic environment for collaboration, innovation, engagement with the world, scholarship, and new forms of public participation—and this was all evident here on Sunday in abundance. Many thanks to Wikimedia DC members for being so generous with their experience and enthusiasm. This entry was posted in Experiment Station and tagged American Art, library, Made in the USA, Wikipedia. Bookmark the permalink.